On World No-Tobacco Day commemorated on May 31st, Ministry of Health with the support of WHO, launched national guidelines for the prevention and management of cardiovascular diseases. 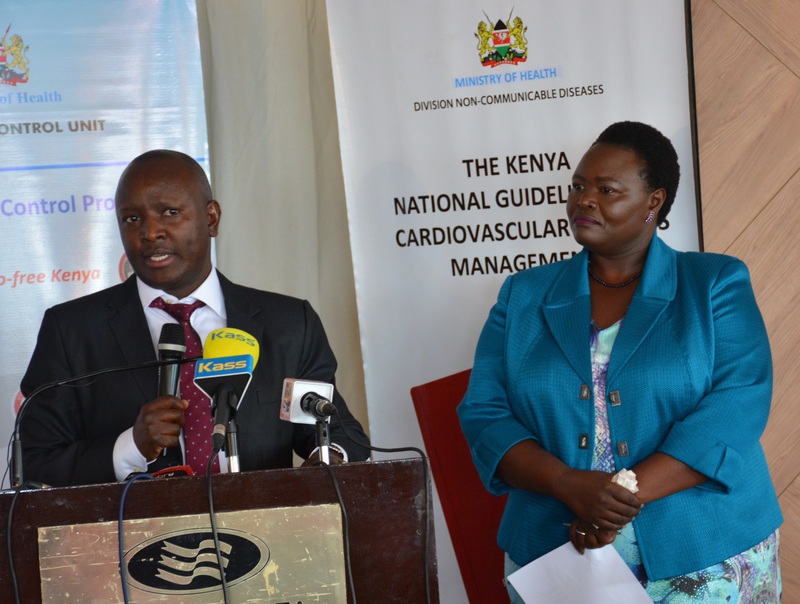 Under the theme “Tobacco and Heart Disease” the event was presided over by Dr Jackson Kioko, the Director of Medical Services, who represented the Cabinet Secretary for Health, Mrs. Sicily Kariuki. 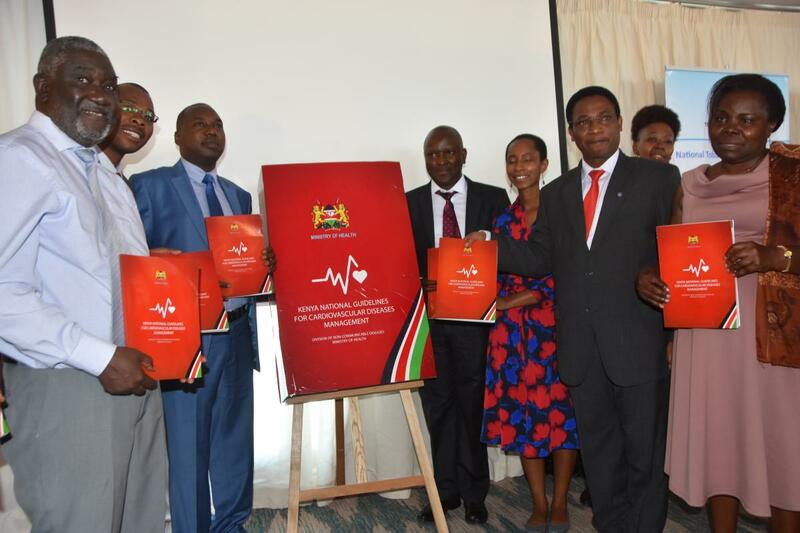 Dr Kioko said that the guidelines were a major milestone in the country’s response to Non-Communicable Diseases (NCDs), which account for 50% of hospital admissions and 55% of hospital deaths in Kenya. 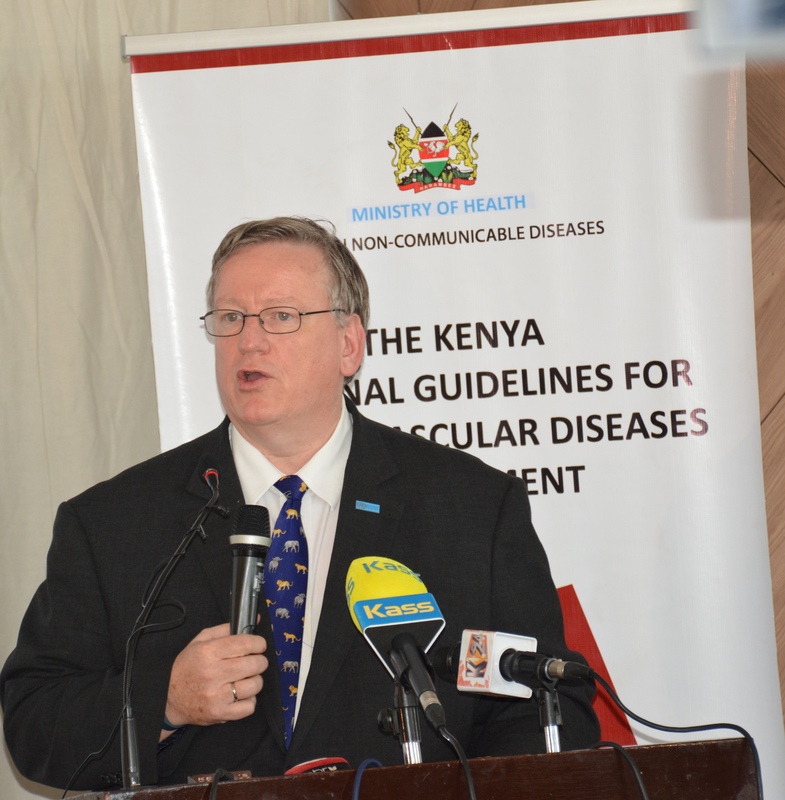 Cardiovascular diseases (CVDs) are responsible for much of the NCD burden, he emphasized. Estimates show that 25% of hospital admissions and 13% of deaths in Kenya are due to CVDs. Hypertension is the most significant risk factor for CVD according to the National STEPwise Survey for NCDs carried out in 2015. Significantly, the survey shows more than half (56%) of the adult population has never had their blood pressure measured yet almost 1 in 4 Kenyans is living with hypertension and with just about a quarter of them being on medication. The survey also revealed that over 90% of people diagnosed with hypertension have not attained control of the disease. Dr Kioko noted that tobacco use and exposure to tobacco smoke is a major cause of raised blood pressure and other forms of CVDs including heart attack and stroke. He said this year’s World No Tobacco Day theme “Tobacco and Heart Disease” was very timely. 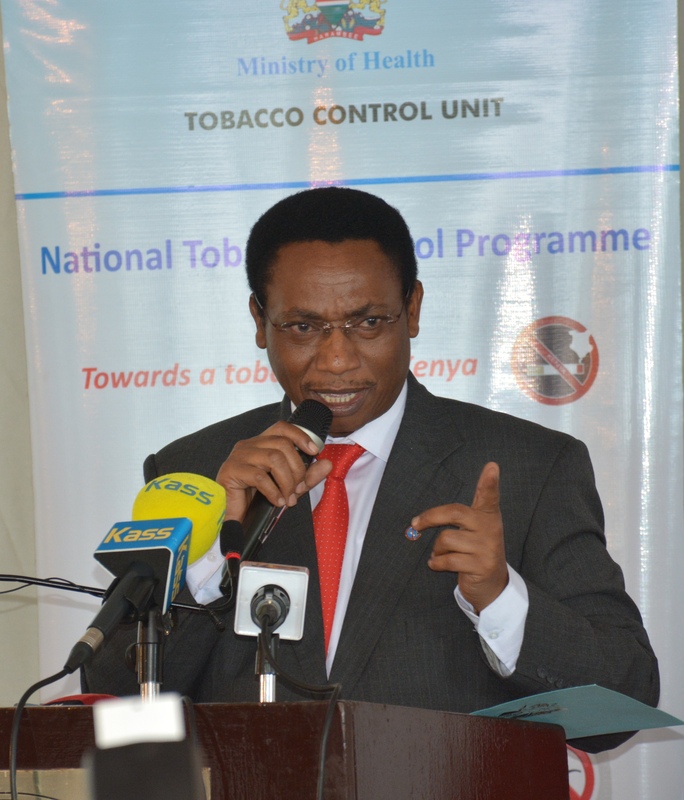 About 11.6% (2.5 Million) of adult Kenyans and 9.9 % of youth aged between 13 -15 years use tobacco products; while 86.1% of adults are exposed to second-hand tobacco smoke in bars and night clubs and 24.8% of youth being exposed at home. This demonstrates that a high number of Kenyans are prone to tobacco-related NCDs such as hypertension and other CVDs, he said. 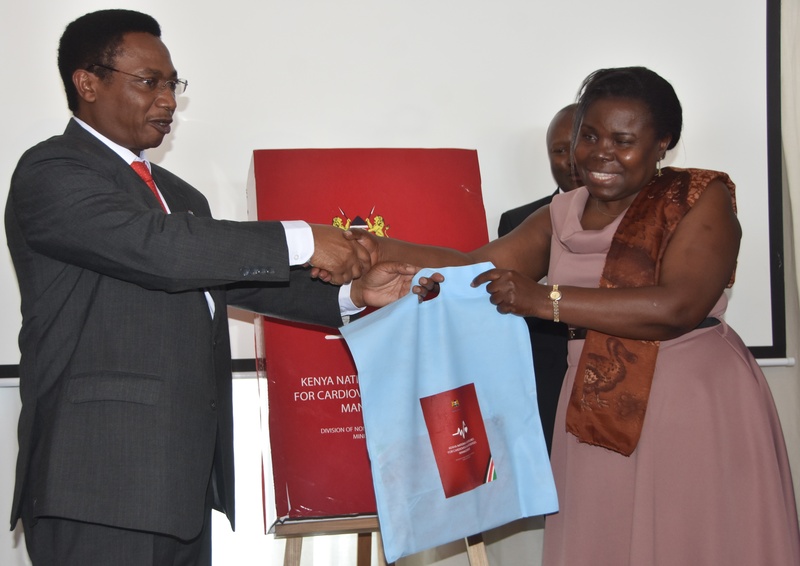 Dr Kioko said that the Ministry was keen to halt and reverse the trend of NCDs by addressing the risk factors and educating the public on adopting healthy lifestyles. He noted that the guidelines contained up-to-date, innovative and evidence-based approaches towards bridging the gaps in prevention and control of CVDs. “They offer guidance in prevention and screening, as well as standardizing the treatment of cardiovascular diseases across the country. This will therefore ensure improved quality of care for persons living with cardiovascular diseases hence better health outcomes and achievement of universal health coverage,” he said. Dr Rudi Eggers, the WHO Country Representative on his part congratulated the country for another major milestone towards halting and reversing Non-Communicable Diseases that are on the increase in the WHO African Region. He said that Cardiovascular Diseases (CVDs) were the number one cause of death globally. An estimated 17.7 million people die from CVDs each year, representing 31% of all global deaths. Of these deaths, an estimated 7.4 million are due to coronary heart disease while 6.7 million are due to stroke. Over 75% of CVD deaths take place in low and middle-income countries, mostly affecting the poorest people, he said. Dr Eggers said that at the household level, sufficient evidence was emerging to prove that CVDs and other non-communicable diseases contribute to poverty due to catastrophic health spending and high out-of-pocket expenditure and that at macro-economic level, CVDs place a heavy burden on the economies of low- and middle-income countries. Most cardiovascular diseases could be prevented by addressing behavioural risk factors such as unhealthy diet and obesity, physical inactivity, harmful use of alcohol and tobacco use Dr Eggers added. • Encourage countries to strengthen implementation of the proven MPOWER tobacco control measures contained in the WHO FCTC. He reiterated that the goal of WHO was to effectively control cardiovascular disease risk factors that include tobacco use/or exposure to tobacco smoke and to reduce the burden of the fast growing cardiovascular disease epidemic, particularly in developing countries. He called upon all to come together and support the government in addressing prevention and control of Non-Communicable Diseases and in particular cardiovascular diseases. “Tobacco breaks hearts! Choose health, not tobacco” he added. Others who made remarks at the event included MOH team, among them Dr Izaq Odongo, head of department of Curative Services, Dr Peter Cherutich, head of department of Preventive and Promotive Health, Dr Joseph Kibachio, head of NCDs Division, Acting Chair of Tobacco Control Board, Rennie Omondi and the President of the Kenya Cardiac Society represented by Dr. Bernard Githura.